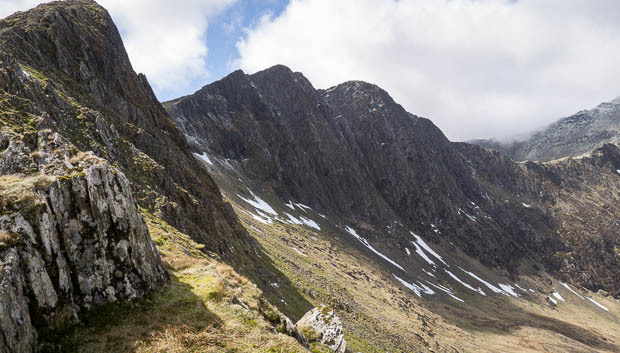 Snowdonia again, with a plan to head up Gallt Y Wenallt, then down to explore Cwm Tregallan and camp somewhere between Snowdon’s south ridge and Cwm Clogwyn. 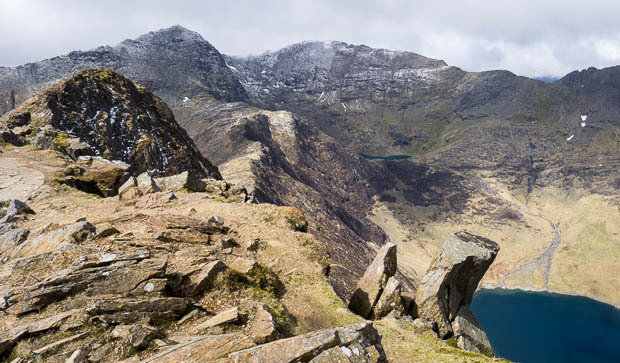 Gallt Y Wenallt is the “missing nail” in the classic Snowdon Horseshoe walk – while it’s a separate 2000′ summit, and naturally follows on from Y Lliwedd, most walkers give it a miss and head down back to Pen Y Pass after Lliwedd Bach. After an early start I was parked up in Bethania fortifying myself with a bacon roll from the Caffi Gwynant before setting off up the Watkin Path. 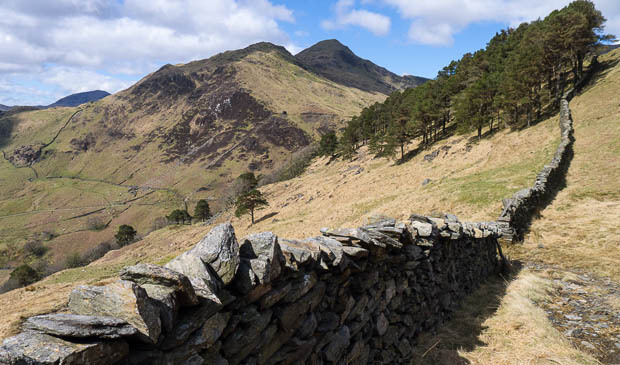 The path takes you up past the National Trust-owned farm of Hafod y Llan, past numerous warnings about the ongoing work for the new small hydro scheme being built. 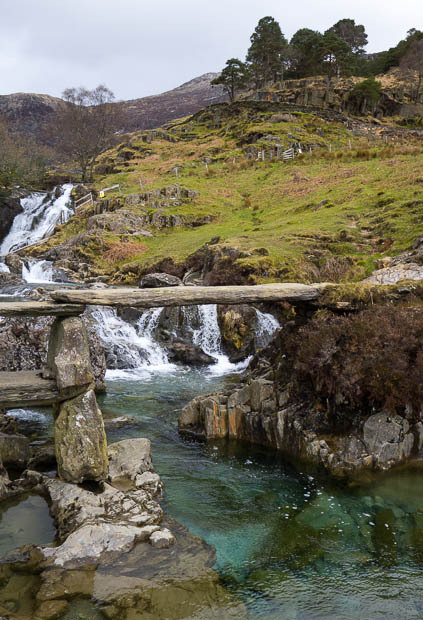 Before reaching the works at the head of the hydro scheme, I left the crowds heading up Snowdon, and took the stone bridge across the river above the falls, and headed into Cwm Merch. A good track climbs through the trees and then up into the higher levels of the cwm, with views of yr Aran and Hebog behind you. The first stop was the remains of Cwm Merch copper mines. 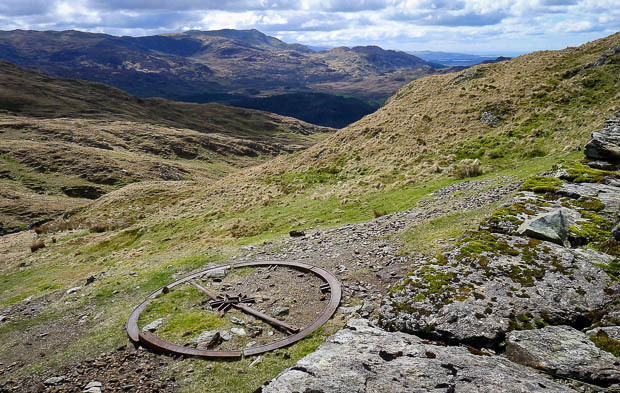 Spoil heaps, old mine buildings and machinery, and adits cut into the rock right by the track gave plenty to investigate. 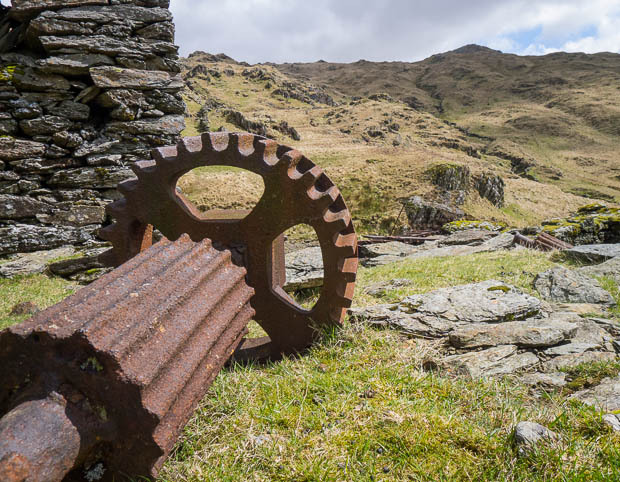 There’s another copper mine right across the NantGwynant at Sygun, which is well worth a visit on a rainy day. You can follow a fixed trail deep within the mine, with the obligatory audio-visuals giving a good insight into the dangerous lives of the Victorian miners. The track disappears now, but the top of Gallt Y Wenallt is (almost) in sight. I made a bee-line to an attractive pointy cairn-topped peak which is actually just a hundred metres or so south of the true summit. 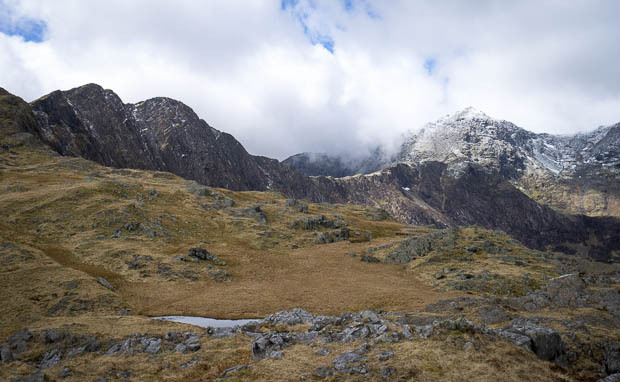 It’s a straightforward climb over grass, with Snowdon – covered in fresh snow and intermittent cloud – sticking its head over the ridge as you approach. 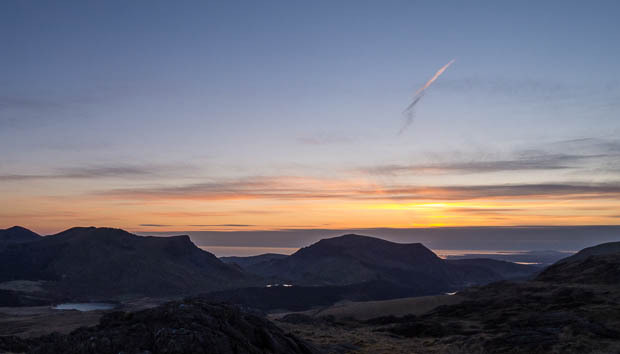 The summit gives great views down the NantGwynant valley to the south, and down Duffryn Mymbwr to Capel Curig in the east. 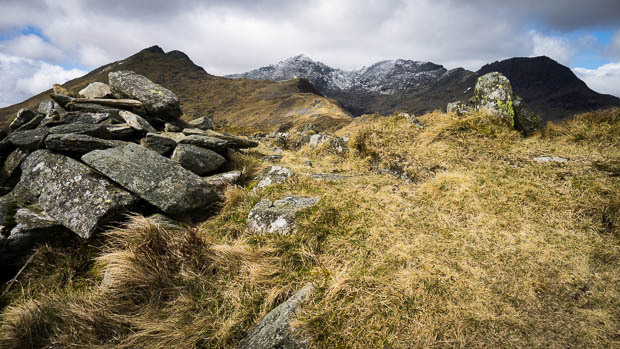 An easy mile takes you to the foot of Lliwedd Bach, and a steady trickle of walkers completing the horseshoe and heading down to Pen Y Pass. 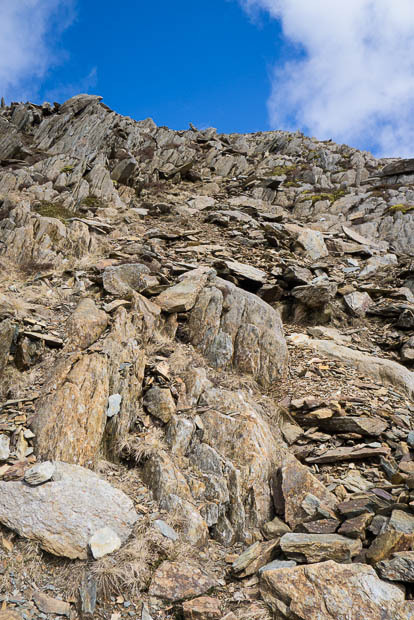 Despite this, I still managed a few minutes alone on both of Y Lliwedd’s peaks, before dropping back down towards the Watkin path. The rocky path isn’t that obvious in descent, and after going down a hundred metres or so I found myself below the path. The terrain below looked manageable, and I could see the Watkin easily so I carried on down. There’s a surprising amount of what I think is Dwarf Juniper growing in and around the scree slopes here. Back on the path, I could see the quarries in Cwm Tregallan below, and I was soon able to pick a route towards them. There’s extensive buildings, spoil heaps, some dangerously deep and unfenced pits. One of the smaller buildings was home to a rapidly decomposing goat (probably dead from last month’s heavy snow), so didn’t invite further investigation. I followed the incline down to the river, crossed at the bridge, and now had a good slog back uphill to Bwlch Cwm Llan, with Yr Aran above. 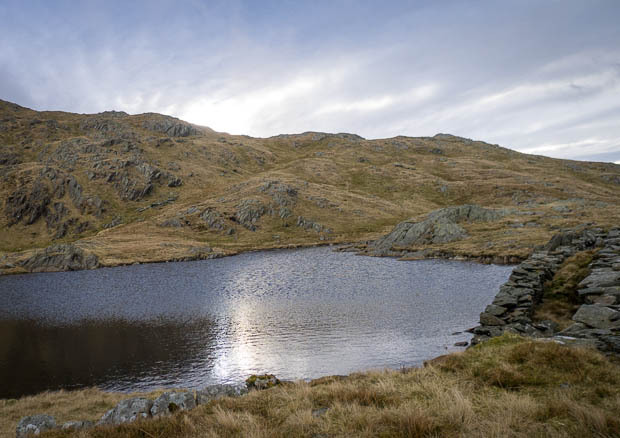 My map showed a small reservoir high above the quarries, just off the south ridge, and I was aiming to camp near that., on the edge of Cwm Caregog. 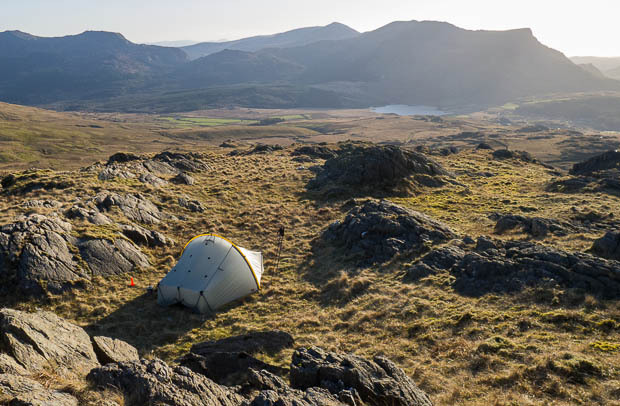 There was a large gaggle of tents being packed up when I got there, so I kept on for a few hundred metres, and was rewarded with a great level and dry pitch, well sheltered, and with running water nearby. Up with the tent, on with a brew and some food. For the first time, I was carrying a pair of Crocs (ugh!) to use as camp shoes. Normally, once my boots are off, I’m stuck in the tent until morning (emergencies notwithstanding!) Being able to ditch wet boots and socks as soon as the tent was up made it easy to meander around outside the tent at the end of the day. Crocs are pretty light (380g for size 10 pair), but don’t pack down at all well, so I’m going to look for some more compressible alternatives. The view from the pitch of the Mynydd Mawr and the Nantlle hills was great, but as soon as the sun had gone down properly I was out like a light. The sun gets up early at this time of year, and after an early (and chilly) night, so did I. Down to around 2 degrees in the tent, but warm enough in the sleeping bag. I was packed up and heading towards the bwlch around 7AM. The cloud had come in during the night, and was covering the higher summits. Wheatears seemed to have been following me around all day yesterday, and the pattern was repeated again, with one hopping around the tussocks behind me as I reached the quarry track down Cwm Llan. 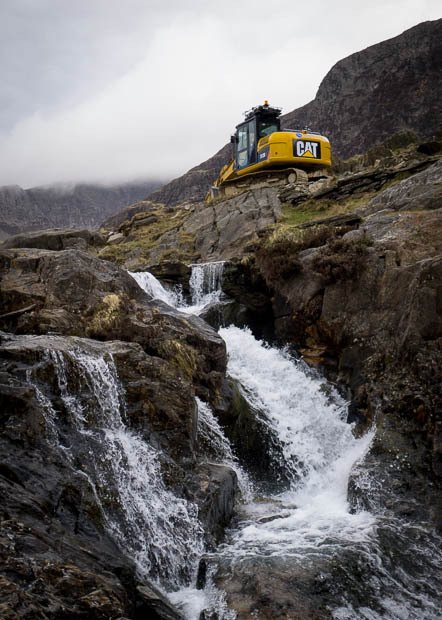 The track takes you down to head of the new Hydro scheme, which hopefully will lose the incongruous notices and JCBs before too long. An easy stroll back down the Watkin path took me back to Bethania, arriving just as the Caffi was opening up for breakfast. Despite spending around 24 hours on Snowdon over a sunny weekend, for the majority of that time, I hadn’t seen another soul.